Microblading Procedure and Pricing | Diem Angie Co.
Also referred to as semi-permanent makeup, is the manual process of implanting color pigment in the upper layers of skin by means of tiny, sterile needles to produce the appearance of hair strokes. This is a semi-permanent option lasting anywhere from 10 months – 2 years. Get our promotional offer today for $350. Book an appointment for $350 today! *We require $100 deposit to reserve your date. Deposits are non refundable. Before you schedule your appointment with us, please read the contraindications, pre-op instructions & aftercare below for the best results. It is extremely important to review this list prior to booking any Microblading or permanent makeup procedures at our studio. It may slightly vary from different places and depending on the artists. At MaiLash & Brows, client’s safety and a perfect result are our priorities. Clients who have any of these listed contraindications are not a candidate of microblading or permanent makeup procedure. Have skin diseases such as: Psoriasis, eczema, undiagnosed rashes and blisters. Allergic to makeup and colors, or easily trigger post inflammatory hyper-pigmentation. Individuals who attempt to cover or camouflage Telangestasia or birthmarks. Herpes simplex is also a contraindication. 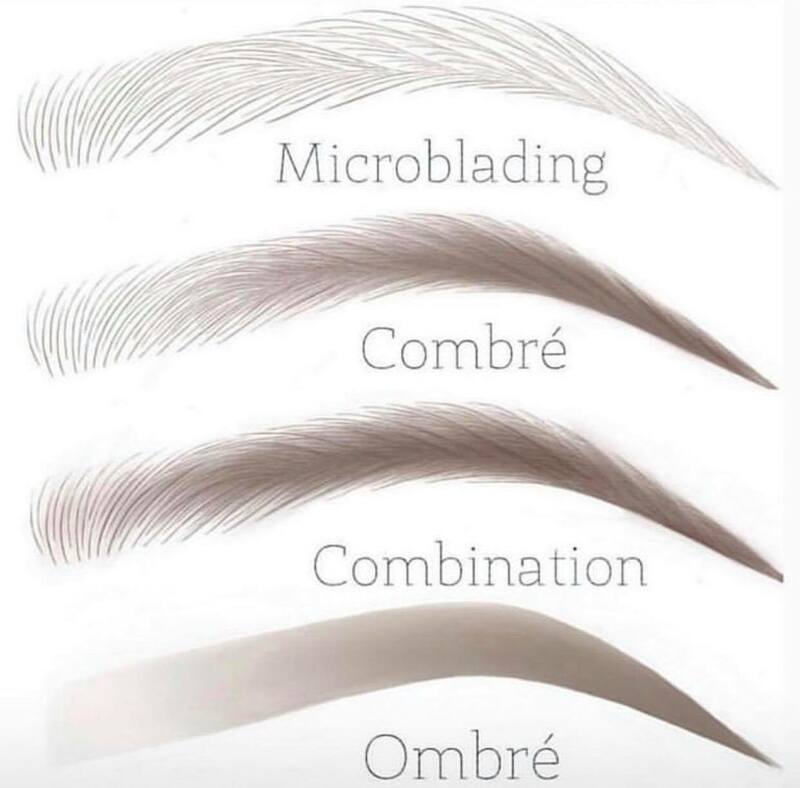 Review the contradictions above to make sure you are a good candidate for microblading. Please be honest because we want the best healing result for you. Coming with eyebrows filled in is preferred. We want to better understand your daily makeup routine to choose a shape that best fit your facial structures, as well as lifestyle. Bring yourself a pair of earphones and iPod. Make yourself feel as comfortable as you can including, wearing comfortable clothes. 24 Hours prior: Showering before your procedure is a good idea, since you will not be able to get your new eyebrows wet. This will allow your pores to open up for better pigment penetration. 24 Hours prior: Please do not drink alcohol (i.e. wine, beer), coffee or any stimulants (i.e. energy drinks, tea, fat burners, electrolytes, etc.) This will thin your blood and make you bleed more during the procedure. 24 Hours prior: Please do not take Aspirin/Advil or pain relieve meds, Vitamin B12, Vitamin E, Fish oil, etc. This will make you bleed more during the procedure. Bleeding too much can lead to difficulties in implanting the pigment. 2 Days prior: Drink plenty of water than normal to keep your skin “super” hydrated. 2-3 Weeks prior: If you get Botox or fillers around the brow area, make sure to do so 2-3 weeks well in advance. The procedure involves pressing and stretching the brow area, therefore Botox can still shift if not stable. ** As brow artists, we can enhance and balance the shape to “perfect” it. If you are looking to “correct” a significant asymmetry due to differences in bone structures, forehead muscles, etc. on each side, we recommend getting Botox 3-4 weeks before Microblading. 3 Weeks prior: No tanning or excessive laying under the sun. 4 Weeks prior: Stop using Retin-A around the eyebrow area. The skin is too thin and sensitive. 4 Weeks prior: No chemical peels. The skin is too new and thin. Waxing or tinting eyebrows should not be done within 3 days to the procedure. Visitors will not be allowed in the room. Talking during the procedure makes the eyebrows raised and would interfere with the procedure. *Please review the After care form carefully before booking for downtime. ✓ Your new eyebrows will go through several phases during the healing process. The next day after the application and following 1 week, the pigment may appear very dark and sharp. Your eyebrows may look like they are “painted on.” Expect it to be 40% darker than original implanted pigment. This is because the pigment is still sitting on the top and has not yet settled into the skin completely. The color of the pigment will soften gradually over the next 3 – 4 weeks, giving a much softer and lighter look on your brows. They would be lightened by 20% – 40% as they are healing. ✓ Some swelling may occur if you have sensitive skin (especially oily skin type). This will subside. ✓ You may feel tightness around your eyebrow area for the first 1 week. ✓ Once the healing taking place, there will be dandruff flakes and dry skin. This is just superficial color and dry skin being naturally removed from your eyebrows through scabbing. ✓ Itching is absolutely normal as the skin is regenerating itself and new skin is forming. DO NOT PICK! Picking can lift color and pigment from the treated area resulting in unevenness and blank spots. Please let the brows flake off naturally. ✓ Depending on your body’s regeneration, age, immune system and lifestyle that may contribute to the healing process. During the healing process, skin may appear peeling or scabbing, color may look weak, pinkish or grey. This will not be your final result. It takes a full 5-6 weeks or more for your true color to resurface. Please be patient and wait until you are fully healed before you critique your eyebrows. Any refinements can be addressed at the follow up visit. ✓ The way you take care of your eyebrows during the healing process plays an important role in the way it looks after it is healed. Improper aftercare may result eyebrows to be faded or patchy. Your technician will instruct the steps of the aftercare to you at the end of the procedure! Keep in mind that because of the natural skin regeneration, after the recovery period brows might appear lighter than original, some original hair strokes may even faded. It is absolutely normal to have some areas fade more than others. Your skin regeneration is not a process that a technician can control as everyone’s physiology condition is different (i.e. depending on age, immune system, lifestyle, skin undertone, skin types, sebum oil production, hormones, etc.) Therefore annual or once every 2 years color boost/touch up is recommended to maintain. Oily skin and red-head clients will lose/blur pigments faster than normal skin. Clients who are on thyroids or certain prescribed medications may also lose pigments faster and be more vulnerable to infection if not careful versus someone who is not on any medications. Clients with previous tattoo work, microblading pigment will fade faster. Your technician will do their best to correct the color (if needed, such as red or salmon color tattood eyebrows) prior to implanting the target color on the top. As the result, additional charge may apply for tattoo cover up. Old tattoo cover up with Microblading may need more than 2 treatments. Scar tissues on the brow area may need more than 2 treatments, additional follow up. ✓ Microblading gives the most realistic and natural results based on the current shape of your natural eyebrows. Our eyebrows are not twins; they can only be sisters. Expecting 100% symmetrical on your eyebrows is unrealistic. ✓ We cannot recreate eyebrows that are completely out of your natural shape. (I.e. your brows are naturally straight, we cannot create a super high arch. We can only find the median). ✓ Nothing should be done before the 5th week, even if you believe that they are too dark or too light. Your skin needs to completely healed before the touch up. ✓ 2nd session of microblading must be done at 5-6 weeks. A successful healed result depends on YOUR aftercare. Please follow the instructions below very carefully! Like any cosmetic procedure, it is a process. Please be patient, the healing process takes a few weeks before you can appreciate the result. The healing process is at least 4 weeks. Do not touch your eyebrows during the whole healing process! Do not pick, peel, rub, or scratch the micro pigments on the eyebrows. It may cause scarring or inappropriate pigment loss. If they get too itchy, please use clean dry q-tips gently press a long the brows to help relieving the itchiness. Be very careful not to do too hard that causes pigment to come off with it. PLEASE read and strictly follow your technician’s Aftercare guidelines which, will be given to you after your procedure. This information includes on how to cleanse and moisturize your eyebrows. Please use the products that we have prepared for you! Next 1 week: No Fitness and any activities that require effort. Next 1 week: No Sauna or steamy bath. Next 1 week: No Swimming. Chlorine can cause irritation to the eyebrows. on applying makeup too close to the frame of eyebrows. Next 2 weeks: Strictly forbidden sleeping on your stomach where you are faced down onto the pillow, or too much on your sides that part of your face is on the pillow. When the pillow is in contact with the eyebrows during healing process, it can remove pigments in certain areas causin asymmetrical; not to mention it may cause infection. Next 1 month: Strictly prohibited exposure to sunlight or any other form of UV rays (i.e. tanning / beach). – Swimming, tanning – out in the sun a lot, exfoliation on the eyebrows, wearing makeup on the eyebrows and removing them off at night. -Using anti-aging cream, Retin-A/retinol products, acidic cleansers, regular chemical peels on the eyebrows. Do: wear sunscreen on the brows if you are out in the sun for a long period of time. Ready to get the perfect brows? Say Hello!